Are you looking to book a magician for your next party or event? Be it a childrens party or a wedding at the Nottinghamshire golf club, look no further. Alex Michael is an award winning magician and specialises in performing and entertaining with his unique blend of interactive magic. Through the 10 years of experience Alex has performed at well over 1000 events and is regarded as one of the very best magicians in the UK. Alex has won many awards for his magic and is often invited time and time again to perform in and around the Cotgrave area. Alex has an extensive testimonials page on his website http://www.alexmagic.co.uk from just a small amount of people who have witnessed and loved Alex’s magic. These are the types of reactions that Alex Generates at every party that he is invited to perform at . Alex also offers great value for money, is punctual and provides a level of professionalism and service which fully exceeds anyone’s expectations. You can reach Alex to discuss prices or to get details about the various package he offers by either: Filling out the contact form, e-mailing Alex on alex@alexmagic.co.uk or by calling 07890 217 203. Alex will do his best to advise you about what would work best for your party or event. 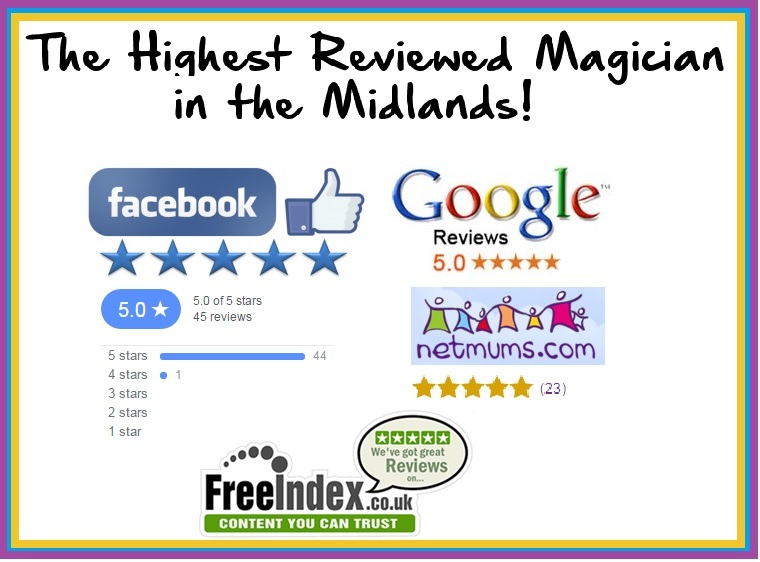 Alex is also referred to as, Magician Cotgrave Nottingham, wedding magician Cotgrave Nottingham, Childrens magician Cotgrave Nottingham, childrens entertainer Cotgrave Nottingham.